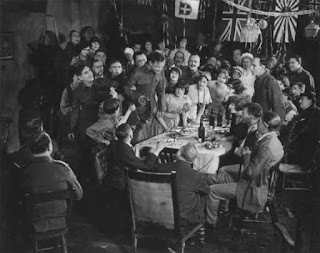 This was one of those silent films that leaves you reeling – imagery, invention and performance intensity all enhanced by a score that refused to let its own power do anything other than add flavour to these already potent ingredients. Ever seen Stephen Horne accompany an uninteresting silent film? Nope, me neither - he always respects the primary source and works to bring out the best of what’s already there: like a skilled actor interpreting a Tudor text. The Guns of Loos was a surprise to those, like me, who had never previously heard of it and, following a day of early British talkies, a step back to silence simply blew those others away. After hours of sometimes ponderous delivery, films that merely played with the novelty of sound and static actors tied by invisible strings to their microphones, we were reminded of just how powerful moving images could be in 1928. This wasn’t the first Sinclair Hill directed film we’d seen today, that was Dark Red Roses (1929) in which a fretful sculptor, David (Stewart Rome) weighs up the option of cutting his cello-playing love rival’s hands off. The action was studio-bound and a few performances aside, Frances Doble was good as the object of the artists’ attention, it just felt slight and a little bit clunky. Not so The Guns of Loos which took a character-led view of the Battle of Loos – known with good reason as Dundee’s Flodden and the largest land battle in British military history. Some 60,000 lives were lost including many from the Dundee divisions of Scottish regiments. Stephen’s score was commissioned by The Great War Dundee Project and Dundee Contemporary Arts to help commemorate the centenary for a city which sent over 30,000 men to fight. 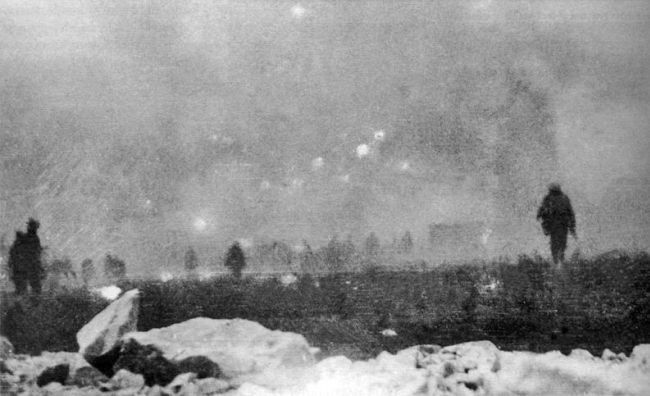 The Guns of Loos is about true love, redemption, comradeship, industrial relations and the movement of horse-drawn gun batteries at speed, over muddy ground. No animals were – probably – injured during the filming of this story but a number of cameramen may have required a rest-cure. There is a love triangle between munitions factory owner John Grimlaw (Henry Victor), a young army officer Clive (Donald Macardle) and Diana Cheswick (Madeleine Carroll here in her first film and who serenely reminded me once again why my granddad Bill was such a fan…). The battle was partly lost due to a shortage of British munitions and Hill smartly ties this in with this smaller scale drama. The film is packed full of “European” camera flourishes – this could almost be a German film… There’s a lovely sequences as the camera pans over the faces of a wedding party a pub... then swaying in grainy close-up as the groom gives a speech. As the locals gather to say farewell to those about to fight, the image movies to and fro as they sing Auld Lang Syne – with Clive and John almost pulling at Diane like a wish bone. The ground beneath is indeed shifting beyond anybody’s control and then as the line moves up screen there appears almost a mirror image below of men and horses trudging over the mud of the western front. There are inspired shots of gun batteries being moved – a tracking shot from alongside and then some shots from underneath which convey the rough-edged energy – the images are blurred and impressionistic, a little bit Gance and something altogether more modern. The impact is visceral and unsettling – the uncertain velocities of battle. A tip of the hat to Hill’s cinematographers: D.P. 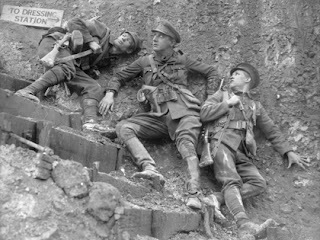 Cooper, Desmond Dickinson and Sidney Eaton. The performances are universally interesting and none more so than from Henry Victor, who, held in close up for so many shots, is a revelation, spitting out his lines as he urges his factory workers on, crying in fear as he breaks down during his first action and then gradually re-building his self-worth urged on by his rival and comrade… There weren’t many heroes this complex in contemporary cinema. Donald Macardle’s eyes are also close to tears as he looks on at Diana in the bitter-sweet adoration of the loser in love… he is decent and strong but Diana sees something great in Grimlaw, something she can help save with her huge, enigmatic frown, gentle smile and… simple excess of lovely. Diana’s mother, Lady Cheswick, is also superbly played by Adeline Hayden Coffin who looks like she may have a crush of her own on young Clive but exudes emotional intelligence. There’s also grand support from Bobby Howes as factory worker then private, Danny and an impossibly young, Hermione Baddeley (a hyper-Hermione: who knew such a thing existed?) as his girlfriend Mavis. These people just feel real and Hill deserves great credit for his casting and coaching. The British war films of the period tended to be as "documentary" as possible and whilst Hill’s reconstructions are no different and are exemplary in that respect, his characters ring true. Which brings us right back to Mr Horne’s score... which was, as always, laced with his trademark integrity, due diligence and lyricism carrying intrinsic warmth that elevates any hope or adds poignancy to any tragedy. Stephen was ably supported by two other players on cornet and percussion*. 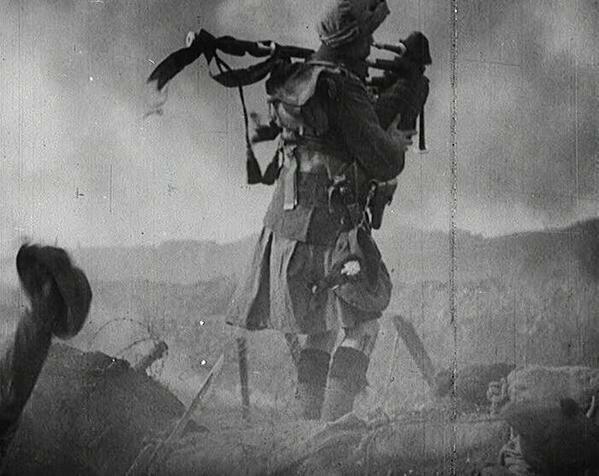 He also had the aid of bagpiper Daniel Laidlaw who not only fought in the battle itself but also appeared in the film. A sample of his playing was inserted in the live music… eerie and effective; if that doesn’t make you feel just a little bit Celtic then you’re English beyond all help! We could have watched the whole show all over again even as the long day closed… Catch the film and live score if you can and here’s hoping that this one gets a DVD release. While we’re at it, isn’t it time for The First Born and The Manxman to also be released? 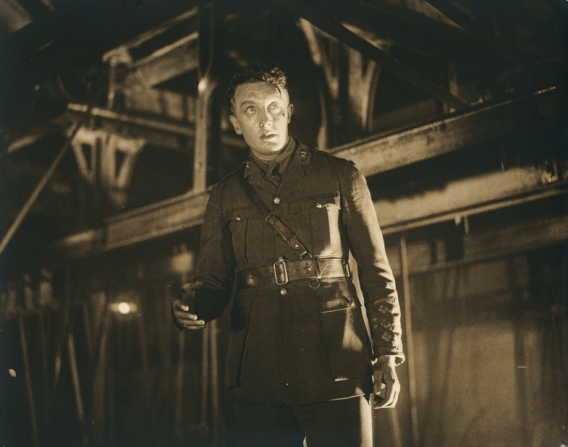 Two of the best British silent films with two excellent Stephen Horne soundtracks… how does that not work as a commercial proposition Mr and Ms Copyright Holder?! You ain’t heard the last of this, mark my words, The Man! *I didn’t catch their names but if someone could let me know I’ll update. Thank you very much for reading! It's hard to beat the combination of live music and film: a new connection every time. Thanks but I'd really like to see official releases of the restored films and Stephen's score - I can't understand why these things get commissioned and then not followed up commercially. That would enable more films to be treated in the same way. It's frustrating but at least we have the live experience! Many thanks Paul! Sorry I didn't see this before, but the other musicians were Geoffrey Lawrence on cornet and Nigel Shipway on percussion. Thanks Stephen and from the Bristol University silent film club! Beth has just asked to borrow It!, Hindle Wakes and half my silent shelf!! Good to hear you are passing on the baton!